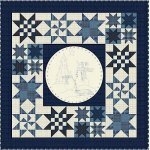 Night Watchman is the newest Block of the Month designed by Material Girlfriends, and will run at Spring Water Designs beginning in September 2019. This beautiful quilt features the rich River Falls Batiks and Aged Muslin fabric collections. Click on the photo for details, and to register now to hold your spot in this Block of the Month Program! Snowmen Snow Globe is the newest Block of the Month designed by Quilt Doodle Designs, and will run at Spring Water Designs beginning in July 2019. This fun & cozy quilt features the Primo Plaid Flannels fabric collections. Click on the photo for details, and to register now to hold your spot in this Block of the Month Program! Tapestry is the newest Block of the Month from Wing and a Prayer Design, and will run at Spring Water Designs beginning in May 2019. This beautiful quilt features their upcoming Tapestry fabric collection that features deep rich tones in lovely textures and prints. Click on the photo for details, and to register now to hold your spot in this Block of the Month Program!